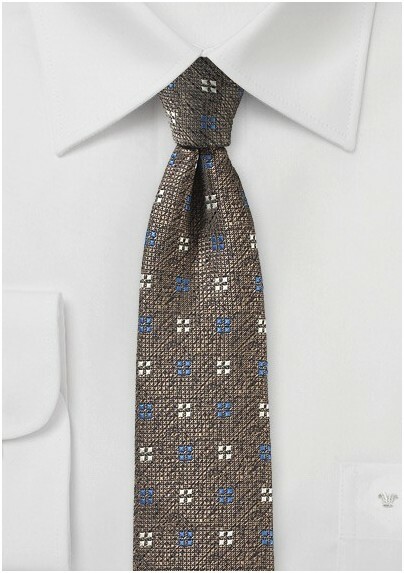 The color and texture of tree bark, this tie mimics your natural surroundings with its unique texture. Overlaid with micro-checks and tiny window-like spots in ivory and cornflower blue, this is a tie that will really spice up your fall wardrobe. Wear it with a gray sweater-vest and ivory shirt, or with any of your fall suits in brown, navy or olive. 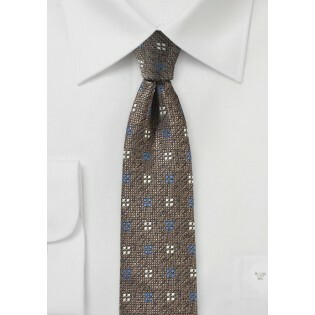 This tie is made from woven microfiber, which is both durable and fashionable. It comes in the slim width of 2.75 inches. Necktie Length: 58", Slim Width: 2.75""